I was digging through my old blogs last night to find the post I had written for the National Bookstore/ Philippine Star “If My Life Was A Book” contest a few years back when I stumbled into one of my all time favorite pieces ever (yes, it’s all about me, hehe…it’s my blog after all!!!). The inspiration of this post is actually still very relevant to me, as it remains to be my email signature until now. Rereading it reminded me of so many important lessons I had learned back then, but seem to have forgotten for now. Well, since it’s been dusted off from the archives anyway, I am reposting it here. Oh…and a word of warning….since I scrounged through my Friendster blog (yes, sa Friendster pa ito nagsimula!!!) I may be reposting some of them here in the next few weeks, especially since I don’t get to check that site much anymore anyways. If there is one thing I’ve missed over the past year, it’s probably the good morning messages I used to receive on my cell phone. For some people, a great way to kick-start the morning would be a cup of coffee, the morning paper, and the serene scents of the morning dew. But for me, it was that “toot-toot” of my phone. It wasn’t only that you were remembered by someone, but it for me, the messages had the power to make me laugh or feel good about myself. But my favorite kinds of messages were those that brought insight and made me think. One morning, someone sent me a message that struck me, and has since become a philosophy for my life. In fact, I even quoted this in my e-mail signature. It read, “We could learn a lot from crayons: some are sharp, some are pretty, some are dull, some have weird names, and all are different colors, but despite these differences, they all exist very nicely in the same box”. Nice, huh? I guess one reason it made such perfect sense for me is because growing up, I never really “fit-in”. I was always different from the rest, and I didn’t like it. But as I got older, I learned to appreciate my uniqueness, and yes, I learned to stop trying to fit a square peg in a round hole. More than this, I realized that I may be different, but I fit nicely in the same world that everyone else fits in. Not necessarily like a red or a blue, but with my own purpose. Then one day, someone added this to my heart song: “and some are broken…and they can’t be put back together”. Initially, I didn’t know how to react or what to say. I literally felt my jaw drop. But after giving it some thought, I realized, that’s true. Crayons do get broken, and yes once they break, they can’t be put back together. In fact, crayons are so fragile…a tight grip, a slight fall, a firm press and there it goes. Also, once they’re used, they don’t look as pretty as when they were new. So there I was realizing that maybe my philosophy wasn’t so good after all. It was just a saying and nothing else. But for some reason, I couldn’t get myself to believe in that. Then in hit me. Crayons aren’t packaged very well. Yes, they are dressed nicely when they come out of the box, but when they’re used, they slowly lose that…they get stubby, their wrappers peel off, and they get dirty and stained. I think they’re very much like me. I get all dressed up and pretty to show to the world a mask I wear to protect me from all my insecurities. But behind that mask, when stripped from my packaging, I too am stained by life’s experiences. Life isn’t always pretty, it can leave you chipped and scarred but that doesn’t mean I lose my color inside. For those who get to know me, they begin to see me for who I am. It may not always be pretty at first glance, like a used crayon, but a peer inside, shows my true colors. So I guess we still can learn a lot from crayons, broken though they are. Beyond a darkened exterior and stubby ends, all the way to the last stroke, inside, it’s still filled with color. For me, the color inside is my essence…this is who I really am. In one way, crayons can be re-attached by melting the 2 ends and putting them together but it won’t really be the same. It will forever be fragile and will never be as whole again. It would be good as far as appearances go, but then, who are you kidding? It doesn’t really matter how you are packaged…the essence of who you are is inside and no amount of make-up would change that. I guess being “perfect” isn’t really necessary for if you leave the broken pieces apart, and discover what it’s made of inside, though it may seem ugly because it’s broken, its brokenness may evolve into two separate pieces – more for the world to share. 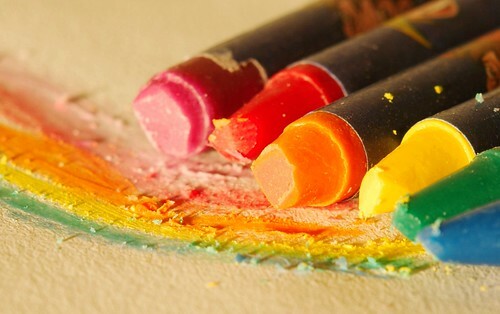 In the end, we are very much like crayons; filled with color, vibrant and beautiful. As we go through life’s experiences, we end up losing that outer brilliance, but it still lives inside us, very much like hope. And till our last stroke, we are brilliant. This entry was posted on Saturday, September 4th, 2010 at 1:16 am	and is filed under It's All About Me, Life Lessons, Random Thoughts. You can follow any responses to this entry through the RSS 2.0 feed. You can leave a response, or trackback from your own site.